Overlooking the Dunes as sunset approaches. Every August, I hit the Great Sand Dunes National Park to photograph the sunflowers and dunes in that light that comes every year in late summer, monsoon light. 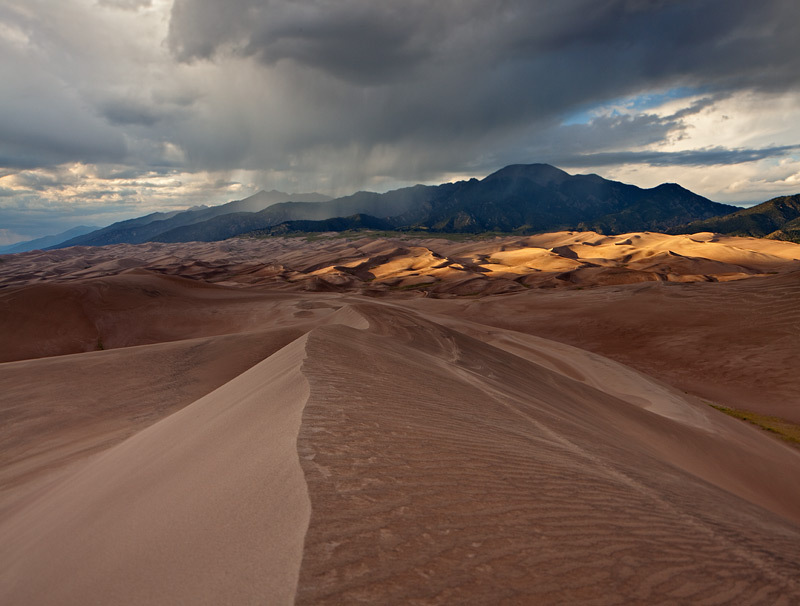 There’s nothing quite like the dunes when sunlight is dancing in between storm clouds. The light, colors, and shapes are always changing and there’s always something new and exciting to photograph. 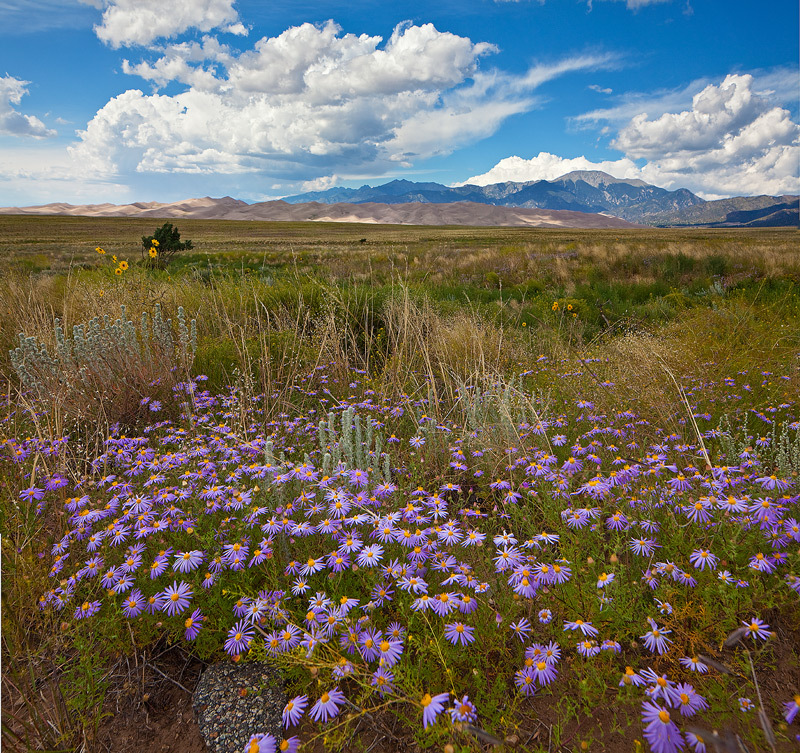 Even before I got to the park, the mix of wildflowers on the side of the road–sunflowers and aster–was too much to resist and I pulled over to take a few shots of the distant dune field and flowers. 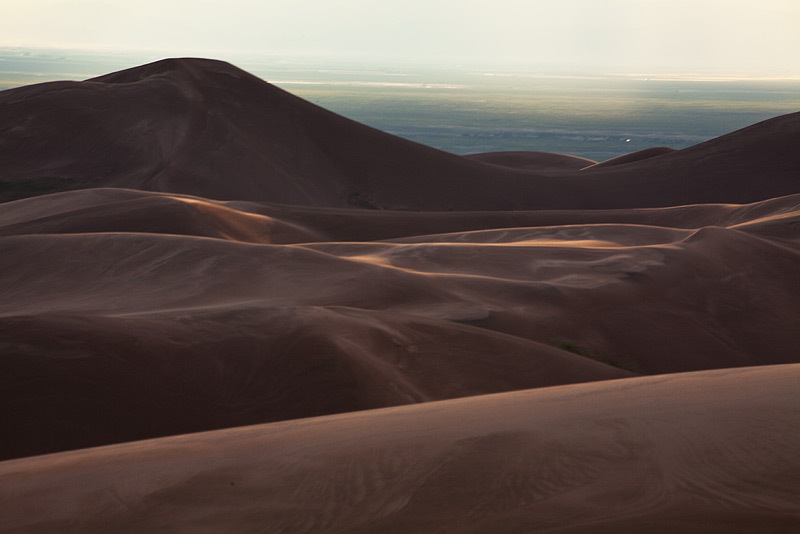 My initial plan was to look for some sunflowers, so I started hiking up towards High Dune. About two thirds of the way up the dunes, a monsoonal shower hit and I had to stay put as I got pelted by biting rain and wind-driven sand. 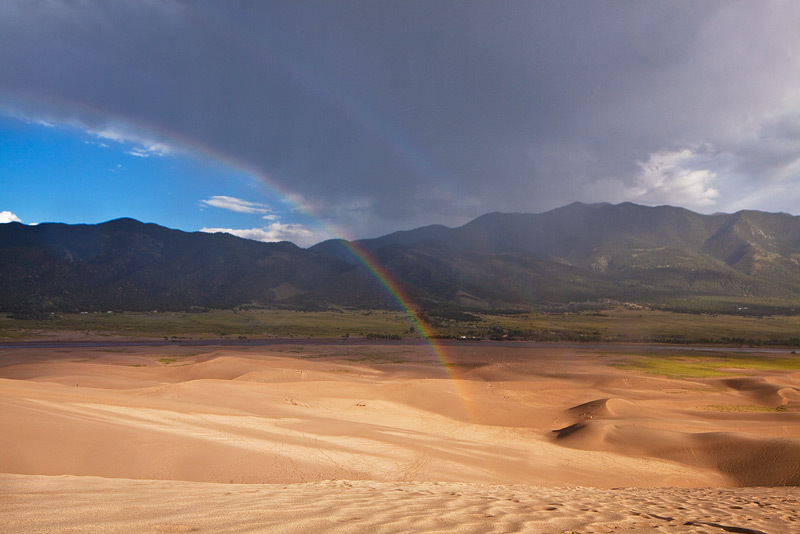 When the worst of the storm had passes, I turned around to find a rainbow framing the Sangre De Cristo Range to the east. Rainbow looking west to the Sangres. The storm had chased most of the visitors from the dunes, and since I had not hiked to the top of High Dunes in a while, I decided to continue hiking to the top. I was joined by a family vacationing from Germany, and later a group of young guys who were driving cross-country. 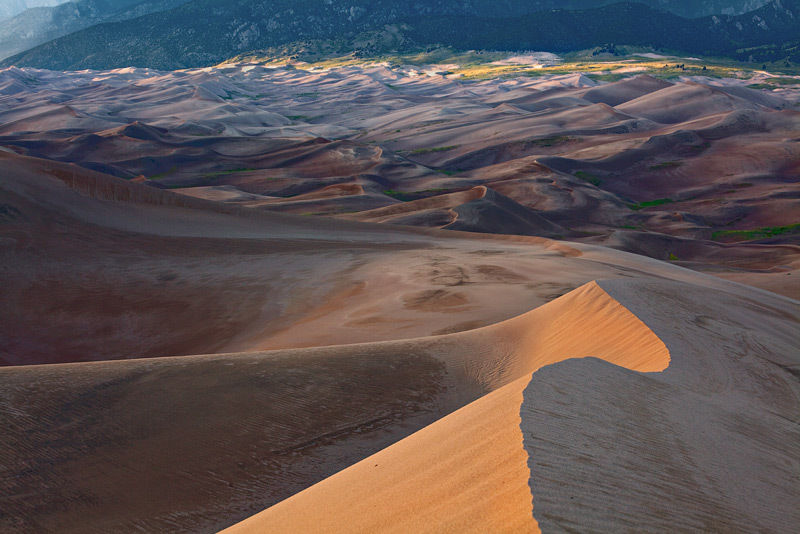 There were plenty of scenes to photograph from the high point at the top of the dune field! Great light from the August monsoon. 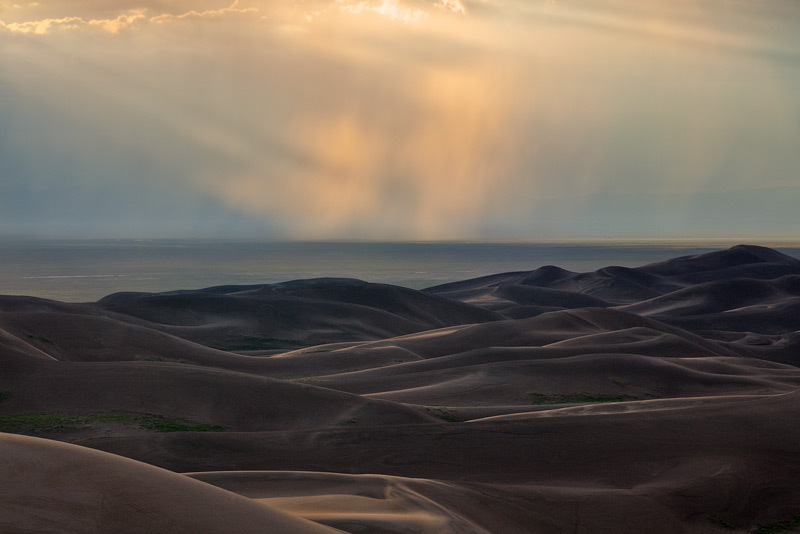 Storm light on the dune field. 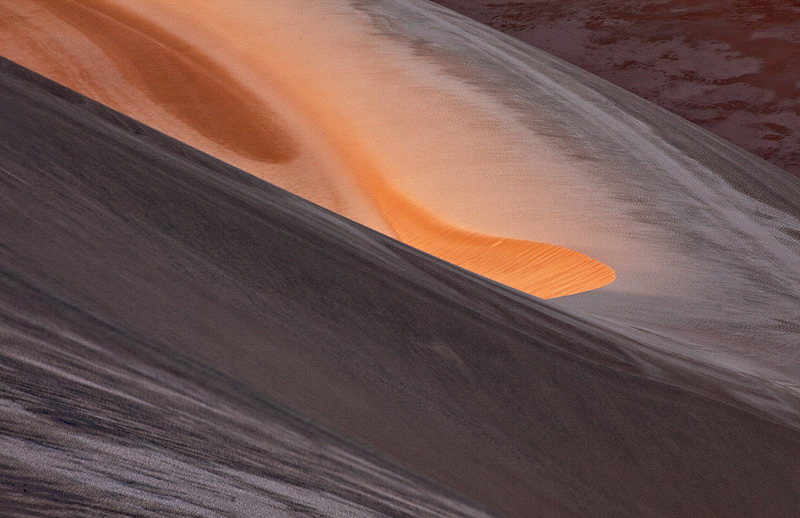 Odd curves and light from the top of High Dune. 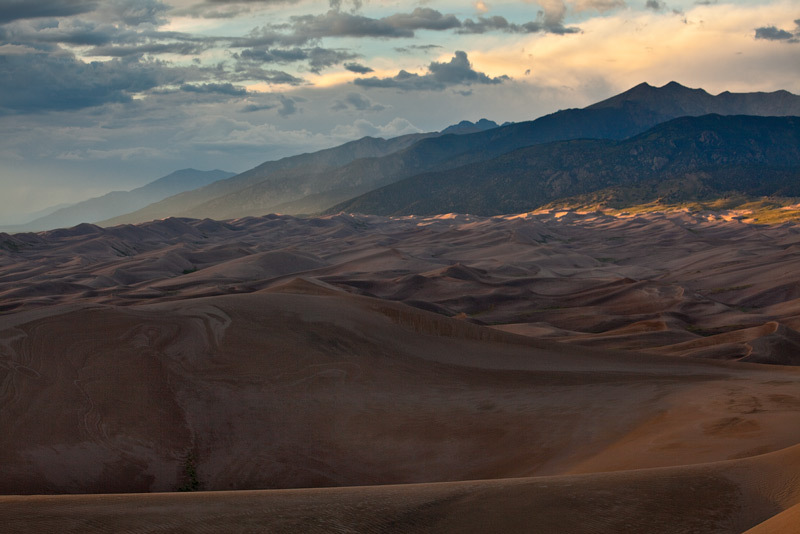 Sunset light filters through distant storms from the top of High Dune. 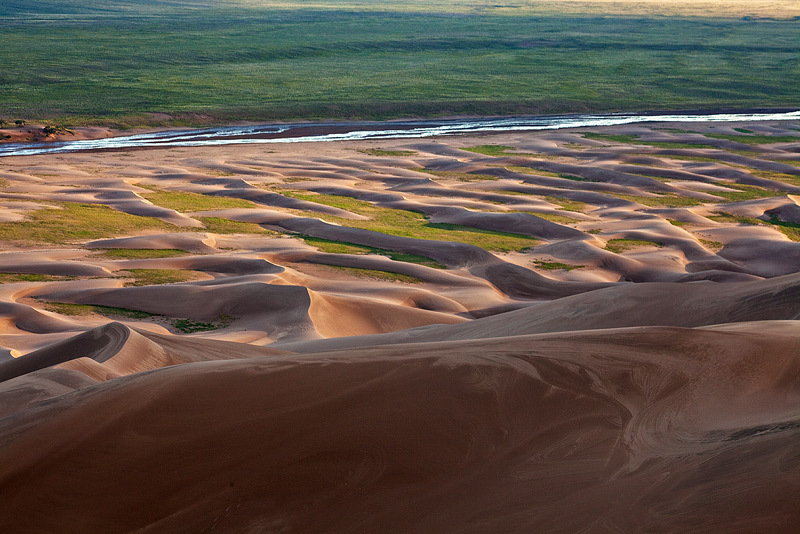 Crazy shapes and colors looking down on the dunes and Medano Creek. 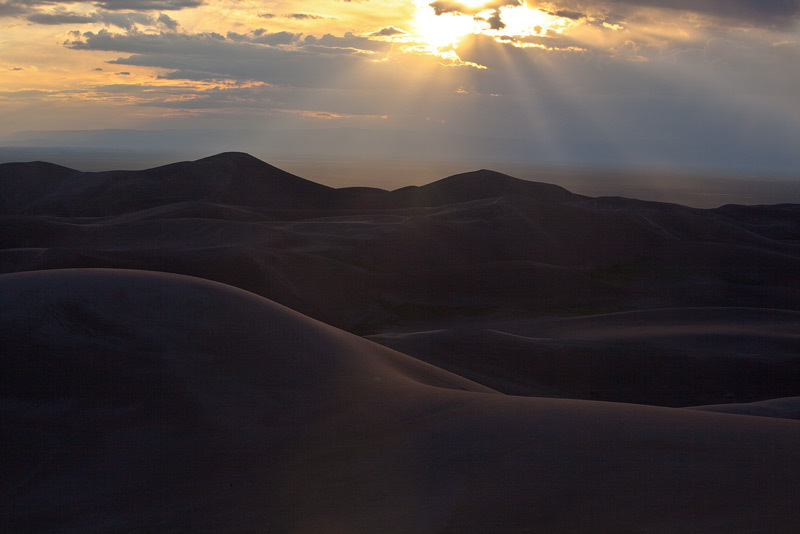 Storm light from the top of High Dune. 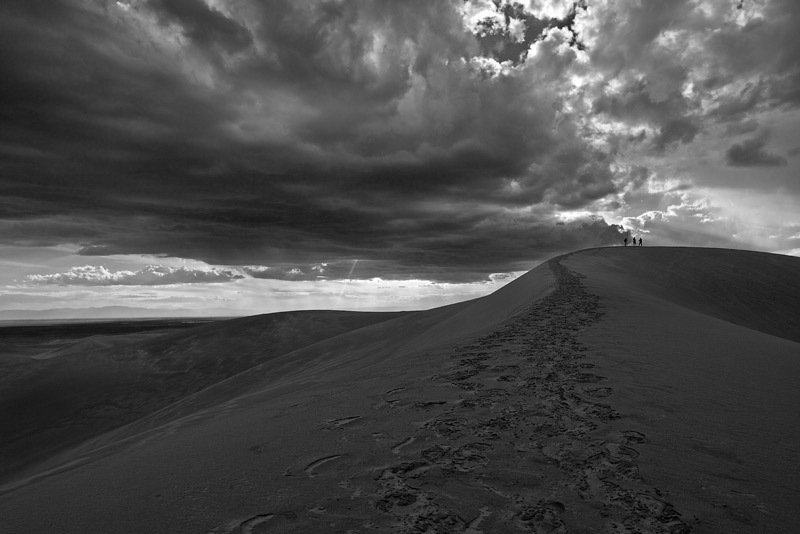 Dramatic light approaching the top of High Dune. 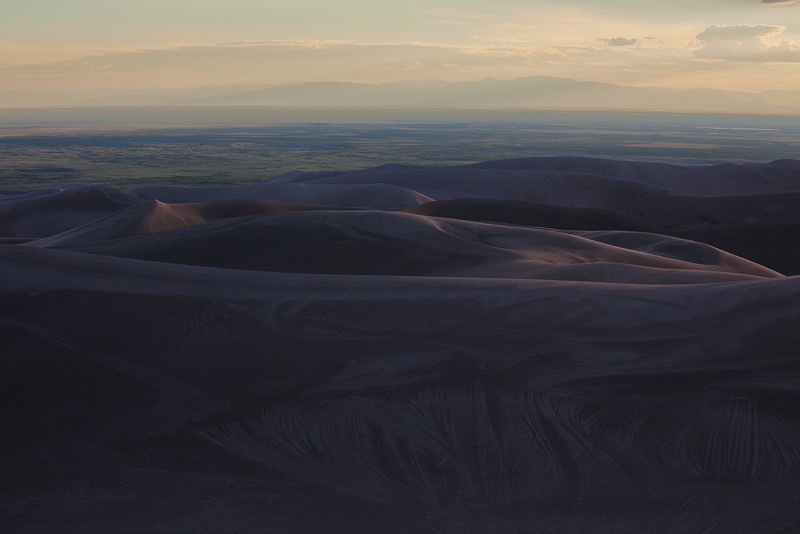 There wasn’t much color at sunset, as the sun dipped below a bank of clouds hanging over the distant peaks of the San Juans, but I couldn’t complain after being treated to such a great display of light from the top of the dunes! 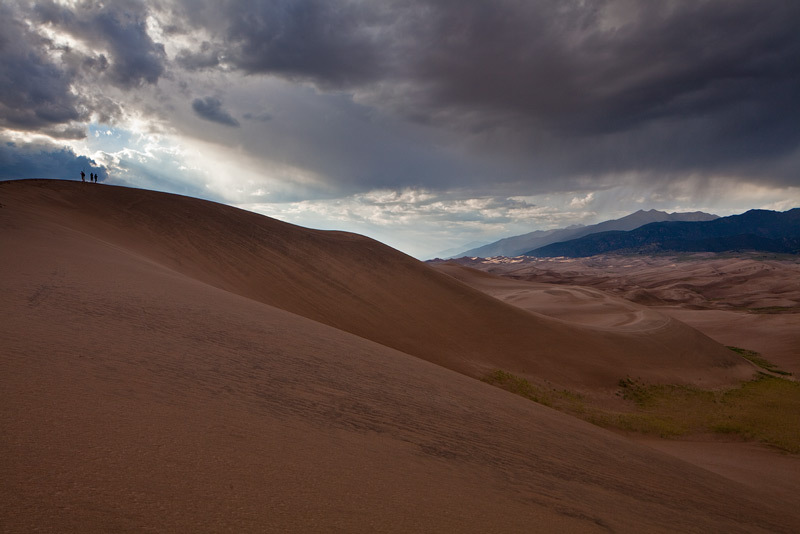 The Processing Debate: Is Digital Art Photography?